SOUTH BEND—Notre Dame got off to a strong start to the new season and then received more good news after the game.The No. 14 Fighting Irish scored on their first two possessions, each of them three-play drives, with Tommy Rees connecting with DaVaris Daniels on a pair of 32-yard TD passes in a 28-6 victory over Temple on Saturday.The Irish announced after the win that coach Brian Kelly had signed a new five-year contract.Kelly said he wasn’t too worried that the Irish (1-0) couldn’t quite seem to put the Owls (0-1) away, saying he had confidence in his defense. “I was OK with the dink and dunk that they were going exhibit on offense,” he said. For Notre Dame, the victory was welcome after a turbulent offseason following an embarrassing 42-14 loss to Alabama in the national championship game.The victory sets up a big game against Michigan next Saturday night. “We’re going to have to play better in all phases against Michigan next week, but we’re going to enjoy this victory today,” Kelly said. The victory was the 200th career win for Kelly, improving his overall record to 200-68-2 and 29-11 at Notre Dame.The Owls, picked to finish ninth in the 10-team American Athletic Conference, fell to 2-76 against ranked opponents. “We left a lot of points on the field,” Temple quarterback Connor Reilly said. Although Temple was a heavy underdog, it was still a bit of a disappointing start for first-year Temple coach Matt Rhule, because of missed chances. “They proved that they can play with that team,” Rhule said. Rees, who regained the starting quarterback job when Everett Golson was suspended from school for the fall semester, was 16 of 23 for 346 yards, his fourth career 300-yard passing day. “I saw some really good things, and some things that we’re going to have to get better at,” Kelly said. One of the questions about Rees was whether he could beat opponents deep in the passing game.But Rees threw a pair of long TD passes to Daniels, who didn’t have a touchdown catch last season. Daniels beat Temple cornerback Anthony Robey on both TDs.The first drive started with Amir Carlisle breaking a 45-yard run up the left sideline to the Temple 37. While the second was set up by a short pass to TJ Jones, who broke two tackles, for a 51-yard gain. “One of the questions coming in was: ‘Can we push the ball downfield?’ I think we answered a lot of those questions right away with his ability to push the ball downfield. I think his patience was better and it will continue to get better,” Kelly said. Rees said he was pleased. “There are some things out there that we have to fix as an offense, but I was pleased with how the entire offense played,” he said. There were some encouraging signs for Temple. First-time starter Reilly was solid, completing 23 of 46 passes for 228 yards, which was more than the Owls had in any game last season.He also ran for 65 yards on 12 carries. Rhule installed a pro spread offense after the Owls had the fifth-fewest yards passing in the nation, averaging 121 yards a game.But Temple missed a pair of field goals wide right before finally scoring in the second quarter to cut the lead to 14-6, with Kenny Harper scoring on a 1-yard run.The Irish didn’t give up a rushing touchdown in going 12-0 in the regular season last year until the eighth game against Oklahoma. Cooper’s PAT was blocked by Notre Dame defensive lineman Jarron Jones.The Irish answered 18 seconds later when Rees hit Troy Niklas at midfield and he faked his way past two Temple defenders and raced for a 66-yard touchdown.Temple opened the second half with another strong drive, advancing to the Notre Dame 6.Reilly threw four straight incomplete passes as Rhule decided to go for it on fourth-and-6 instead of trying another field goal.The Irish responded quickly again with a 94-yard scoring drive, highlighted by a 33-yard pass from Rees to Chris Brown. George Atkinson scored on a 2-yard run to make it 28-6.For the Irish, it wasn’t the dominant defensive effort many expected against Temple. IOWA CITY—Mathew Sims hit a 36-yard field goal with four seconds left and Northern Illinois rallied to beat Iowa 30-27 on Saturday in the season opener for both teams.Jordan Lynch threw for 275 yards and three touchdowns for the Huskies, who scored 10 points in the final 5:05 to record their first win over the Hawkeyes.NIU cornerback Jimmie Ward intercepted Iowa’s Jake Rudock with 1:17 left. He brought it to the Hawkeyes 30-yard line, setting up the game-winning kick from Sims.Rudock threw for 256 yards, a touchdown and two picks in his debut for Iowa, which lost its seventh straight game dating back to last season.The Hawkeyes also lost their first opener since 2000.For most of the afternoon, the Hawkeyes did a decent job containing the explosive Lynch – who last season became the first Football Bowl Subdivision quarterback to throw for over 3,000 yards and rush for more than 1,500.But Lynch showed why he’s among the nation’s best quarterbacks with the outcome in doubt.He engineered a 6-play, 75-yard drive in just 1:37, tying the game at 27 with a 33-yard TD pass to Da’Ron Brown with 5:05 left in the fourth quarter.Still, the Hawkeyes had a good shot at a close win – only to blow it yet again.Iowa had the ball at their own 45 with 1:24 left when Ward jumped a route and collected the crucial interception. Cameron Stingily picked up 11 yards on the ground to set up an easy kick for Sims.The Hawkeyes lost four games by four points or less last season. Despite an improved showing for its defense, Iowa again lost in agonizing fashion.Iowa had been anxiously eyeing its opener for nine months after finishing last season with a 4-8 record, its worst since 2000.But the Hawkeyes picked up right where they left off.Northern opened the scoring with a field goal. Tommylee Lewis then used a double move to beat a pair of Hawkeyes on a 40-yard TD pass from Lynch, making it 10-0 late in the first quarter.It took a stellar solo effort to get the Hawkeyes back in the game.Senior linebacker Christian Kirksey drilled Luke Eakes in the open field, forcing a fumble he took 52 yards for a touchdown that got Iowa back within 10-7.A Mike Meyer field goal tied it at 10-10, and C.J. Fiedorowicz’s 11-yard TD grab – set up by a 53-yard flea flicker from Rudock to Jordan Cotton – made it 17-10.NIU and Iowa swapped touchdowns to end the half, as the Hawkeyes led 24-17 at the break.The Huskies stunned Iowa with a fake punt near the end of the third quarter, reaching the Hawkeyes 9-yard line. But the Hawkeyes held from there, forcing a 25-yard field goal from Sims that pulled the Huskies within 24-20.Meyer answered with a 44-yarder to make it 27-20 with 6:42 left.Lewis, who scored both first-half touchdowns for the Huskies, was carried off the field after an apparent left foot injury on the first play of the second half.The Huskies certainly missed Lewis, but Lynch was there to carry them to their 22nd win in their last 24 games. CHAMPAIGN—Nathan Scheelhaase threw for career-best 416 yards and two touchdowns Saturday to lead Illinois to a 42-34 win over Southern Illinois. But the Illini had to hang on late to beat the Football Championship Subdivision school.Trailing with 44 seconds to play and fourth down at the Illini 3-yard line, Saluki quarterback Kory Faulkner threw too high for leaping wideout Adam Fuehne.Illinois was up 42-24 with as little as 12 minutes left.The Illini offense was mostly Scheelhaase. He was 28 for 36 and his second-quarter touchdown passes to Jon Davis and Josh Ferguson built a 25-7 halftime lead.Ryan Lankford caught six passes for 115 yards.The temperature hit 95 and the heat index 108. Big Ten officials said one linesman, Bob Davis, was hospitalized for heat exhaustion. Another Exhibition Schedule is now history.Brian Hoyer started by connecting with Josh Gordon on a 45-yard pass on the first play from scrimmage and ended the game with a comeback. Hoyer threw for 307 yards and came on down the stretch for the Browns after Jordan Palmer dominated the first half for the Bears, leading Cleveland to an 18-16 victory in the preseason finale on Thursday night. Hoyer was intercepted twice. But he also led the Browns (3-1) on a 76-yard touchdown drive that made it a one-point game in the fourth quarter. “I don’t care if it is the fourth preseason game of the year or the last game of the year,” he said. Punter Spencer Lanning kicked a 40-yard field goal with just over three minutes left following a fumble by Harvey Unga to make it 18-16. Robbie Gould then missed a 57-yarder wide right with just over a minute left, and the Bears (2-2) lost after leading most of the way. Signed two weeks ago after third-stringer Matt Blanchard broke a knuckle on his left, non-throwing hand, Palmer made the most of his opportunity with Jay Cutler and Josh McCown sitting out. Palmer, the brother of Arizona QB Carson Palmer, helped the Bears build a 10-3 halftime lead, completing 11 of 17 passes for 111 yards before giving way to Trent Edwards. Palmer led the Bears to a field goal on their first possession after Demontre Hurst intercepted Hoyer and connected with Joe Anderson on a 5-yard touchdown early in the second quarter. Not bad, considering he thought his playing days were over. That changed when he got the call from the Bears, and now, he might have to cancel a trip to Europe next week with his wife. “We’ve been putting it off for the past couple years. And I would love to cancel that trip,” he said. But it was the Browns who finished the preseason on a winning note, with both teams resting their top players. The Bears had said they would do just that, and wide receiver Brandon Marshall wasn’t even at the stadium. He had an excused absence. Marshall also voiced frustration on Tuesday about his recovery from offseason hip surgery and missed practice on Wednesday. He is expected to be ready for the opener against Cincinnati, which is the first game of the Marc Trestman era. The Browns didn’t play Brandon Weeden, Trent Richardson or Joe Thomas, among others. With backup quarterback Jason Campbell out with flu-like symptoms, Hoyer got the call for the Browns and completed 24 of 35 passes. His second interception — by Sherrick McManis — led to a 44-yard field goal by Gould that increased the lead to 16-9 early in the fourth. Hoyer then led the Browns on the go-ahead touchdown drive, finishing with a 14-yard TD pass to Dan Gronkowski with just under 7 minutes left. The Browns went for two, and the pass got broken up, preserving a 16-15 lead for the Bears. Cleveland went ahead on Lanning’s 40-yarder after Unga fumbled and L.J. Fort made the recovery. Lanning was handling field goals after Shayne Graham injured his back in warmups, keeping him out of the game. Gordon started for Cleveland and caught two passes for 77 yards. The Browns want to keep him sharp, since he was suspended for the first two regular-season games for violating NFL’s drug policy. David Nelson made his first appearance since he tore the anterior cruciate ligament in his right knee in last year’s opener with Buffalo, catching four passes for 54 yards. He signed a one-year deal with Cleveland. Brandon Jackson, trying to solidify his spot as the No. 2 running back, had just 5 yards on five attempts. The Browns are thin at the position with Dion Lewis (surgically repaired left leg) and Montario Hardesty (leg) on injured reserve. While Palmer looked sharp in the early going for the Bears, Edwards threw for 135 yards in the second half. He led the Bears to the 3 on the first drive of the third quarter, only to settle for a field goal, and had some bad luck on an interception that James-Michael Johnson returned 23 yards for a touchdown on the Bears next possession, making it 13-9. The ball bounced off the hands of the Bears Fendi Onobun. Michael Ford, vying for the third running back spot with Armando Allen, ran for 48 yards on nine carries. Allen, who’s been limited by a hamstring injury, had 39 yards on 10 attempts. 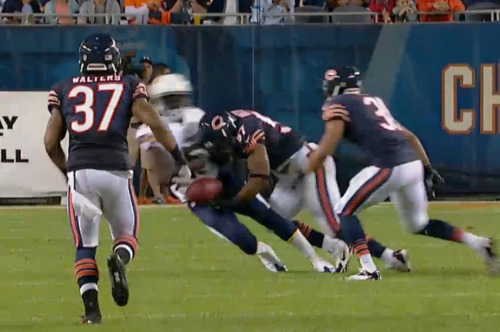 The Bears held out rookie Jonathan Bostic, who’s been starting at middle linebacker with D.J. Williams injured. And Trestman also all but confirmed that first-round pick Kyle Long and fifth-rounder Jordan Mills will start at right guard and right tackle after sitting them on Thursday. NEW YORK—There has been a settlement worth a proposed $765 million in the NFL’s concussion case that included some 4,500 former players suing the league over head trauma.The settlement breaks down to $170,000, on average, per player. Former United States District Judge Layn Phillips, the court — appointed mediator in the consolidated concussion — related lawsuits brought by more than 4,500 retired football players against the National Football League and others, announced today that the parties had reached an agreement that would end the litigation against the NFL and NFL Properties and provide medical and other benefits, as well as compensation, to qualifying injured players or th eir families. Former Eagles and Patriots running back Kevin Turner, who now suffers from ALS and will serve as the lead plaintiff for one group of retired players, is thankful for the settlement. In addition to Turner, some of the names in the lawsuit include Art Monk, Mark Rypien, Tony Dorsett, Alex Karras, Mark Duper and Joe Horn. Class settlement: The settlement will include all players who have retired as of the date on which the Court grants preliminary approval to the settlement agreement, their authorized representatives, or family members (in the case of a former player who is decease. No Admissions of Liability or Weakness of Claims: The settlement does not represent, and cannot be considered, an admission by the NFL of liability, or an admission that plaintiffs’ injuries were caused by football. Nor is it an acknowledgement by the plaintiffs of any deficiency in their case. Instead, it represents a decision by both sides to compromise their claims and defenses, and to devote their resources to benefit retired players and their families, rather than litigate these cases. Timing of Payments: If the settlement receives final approval, and any appeals have been concluded, the NFL will pay approximately 50 percent of the settlement amount over three years, and the balance over the next 17 years. Injury Compensation Fund: The fund of at least $675 million will be available to pay monetary awards to retired players who present medical evidence of severe cognitive impairment, dementia, Alzheimer’s, ALS, or to their families. The precise amount of compensation will be based upon the specific diagnosis, as well as other factors including age, number of seasons played in the NFL, and other relevant medical conditions. These determinations will be made by independent doctors working with settlement administrators appointed by the District Court. OAKLAND—Jay Cutler and the Bears look ready to start the season. The Oakland Raiders look ready for a quarterback controversy.Cutler led five first-half scoring drives, Matt Forte gained 109 yards from scrimmage and the Bears beat the Raiders 34-26 Friday night in the final big dress rehearsal for the regular season. Cutler and Forte connected on a 32-yard touchdown pass, former Raiders running back Michael Bush added a pair of touchdown runs and Alshon Jeffery caught seven passes for 77 yards as the Bears (2-1) broke out to a 27-0 lead in the first half. This was likely the last full test for the Bears first-team offense before the season as the top stars will play sparingly — if at all — in the exhibition finale next week against Cleveland. The Raiders (1-2) might need to use next week’s game against Seattle to figure out who their quarterback will be. Matt Flynn threw two interceptions on just six passes before being pulled in favor of Terrelle Pryor in the second quarter to the delight of frustrated Raiders fans. Oakland’s first-team defense was shredded and the usually reliable Sebastian Janikowski even missed a 49-yard field goal before connecting from 58 yards out on the final play of the first half to get Oakland on the board. Pryor electrified the crowd by leading a late field-goal drive in the first half and then running and throwing for scores in the third quarter. Pryor finished 7 for 9 for 93 yards passing to go along with 37 yards rushing and led Oakland to 20 points on five drives and made a case that he should be the starter when the season starts. The Bears came into this game looking to show their passing offense was more than just Brandon Marshall after he was targeted on all five throws by Cutler last week against San Diego. Cutler managed to do that on the first drive with long completions to Jeffery and tight end Marcellus Bennett that set up a field goal by Robbie Gould. “We just called more of our packages and everybody got a chance to get the ball,” Bennett said. Both those completions came against Raiders rookie D.J. Hayden, who played his first game since a near fatal practice collision last November in college at Houston. Hayden recovered from that scare and was picked 12th overall by Oakland, but was not cleared for contact until this week. He missed a tackle on Jeffery’s 22-yard gain, but later on the drive broke up a pass to Marshall. Cutler continued to spread the ball around on the second drive after a Tim Jennings interception. 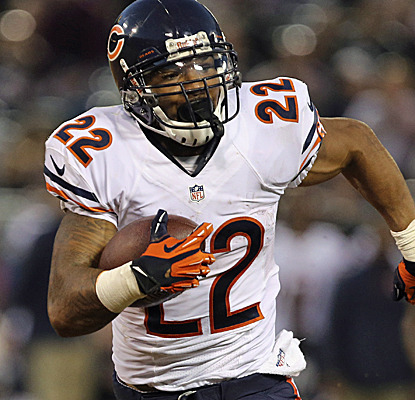 Forte took a swing pass on the next play and went in for a 32-yard touchdown. Cutler led three more scoring drives in the half and finished the night 12 for 21 for 142 yards with the touchdown. He completed passes to five players with none going to Marshall on four attempts in that direction. The Raiders’ first-team offense had no bright spots with Flynn throwing as many interceptions (two) as first downs produced (two) in five drives, leading to frequent boos from the home crowd. Pryor led a late drive for a field goal at the end of the first half and then showed his athleticism on the opening drive of the third quarter. He hit Rod Streater on a 19-yard pass after scrambling out of pressure and then scored on a 25-yard run. Pryor then threw for a score when he threaded a 19-yard pass to rookie tight end Nick Kasa on third-and-16 before sitting for the rest of the game. NOTES—Oakland RB Darren McFadden sat out with a shoulder injury but could have played if it was the regular season. … Bears CB Zach Bowman tore his hamstring. Bears Bostic fined $21,000 for ‘legit’ hit. Jon Bostic was fined $21,000 for this hit on Chargers receiver Mike Willie. LAKE FOREST—Bears rookie linebacker Jon Bostic has been fined $21,000 for an Aug. 15 hit he made on Chargers wide receiver Mike Willie. That news comes from Bostic’s teammate Lance Briggs, who tweeted out the news on Wednesday morning. NFL.com confirmed Briggs’ tweet saying that Bostic was specifically fined for lowering his head on a defenseless player’s body. Now here’s the weird part of the story, the NFL has a clip of Bostic’s hit on the league’s official website and in the caption below the clip, the hit is referred to as a ‘spectacular’ one. The NFL also used the word spectacular in the headline. Of course, as soon as the fine was announced, Twitter pointed out the hypocrisy of calling a hit spectacular, but then still fining the player for said hit. At that point the NFL changed the caption and the headline faster than the NCAA store scrubbed player names from its search engine. Jay Cutler targeted Brandon Marshall and no one else. He zipped a pass into double coverage, only to get intercepted.The new and supposedly improved offense stagnated and the defense made up for it.Same old Bears? On the surface, it sure seemed like it.Cutler looked shaky again and the defense came through, harassing Philip Rivers early on and setting the tone for the Bears in a 33-28 preseason victory over the San Diego Chargers on Thursday night at Soldier Field. All eyes remain on the quarterback after the Bears made some big changes on offense in the offseason, hiring coach Marc Trestman to replace Lovie Smith and revising their line.So far, the results are mixed at best.”There are certain plays we’re running for the first time against a live defense other than the Bears’,” Cutler said. “There are certain things you just have to experience. Sometimes you make mistakes, and sometimes it’s going to go off without a hitch. When I was in Denver, we ran that offense for three years. Year 3, I think all of us had a great grasp of it. We don’t have that luxury right now.”Cutler played a quarter and completed 4 of 5 passes for 38 yards and a touchdown, but the only receiver he targeted was Marshall, who is recovering from offseason hip surgery and sat out last week.Field position played a role in that, as did the Bears not wanting to show too much of their playbook. Still, that’s not a good sign for a team that wants to distribute the ball more evenly this year.On a more positive note for the Bears’ offense, Matt Forte ran for 74 yards and a touchdown on eight attempts after carrying just once in a loss at Carolina in the preseason opener.His 58-yard run around the left end set up the game’s first touchdown, a 5-yard strike from Cutler to Marshall.Rookies Kyle Long and Jordan Mills held their ground at right guard and tackle.Devin Hester also showed a spark, returning the game’s opening kickoff 45 yards. And reserve Michael Ford ran one back 100 yards in the third quarter, leading to a 3-yard scoring run by Michael Bush.The first-team defense sacked Rivers three times and forced two turnovers, even though star defensive end Julius Peppers (hamstring), defensive tackle Henry Melton (concussion) and linebacker D.J. Williams (strained right calf) sat out with injuries.The Chargers lost again after getting pounded by Seattle last week.Rivers downplayed the turnovers, even though he got swarmed as soon as he stepped on the field. He was 5 of 9 for 50 yards with an interception, and he lost a fumble on a sack by Shea McClellin, leading to a 3-yard run by Forte that made it 14-0 near the end of the first quarter.”I think that can be overanalyzed,” Rivers said. “They are what they are, but I don’t see it as a step back. I have seen some bad play and non-rhythmic offenses in the preseason, then they have great years, and I have seen some great drives in the preseason and they all go for nothing in the regular season.”Backup Charlie Whitehurst came in early in the second quarter and was 6 for 9 for 69 yards and a touchdown. He fumbled away his first snap, leading to a field goal by Robbie Gould, but he also led the Chargers on an 80-yard TD drive late in the half.Cutler got sacked twice on the opening drive, an ominous start after he threw an interception on the Bears first play from scrimmage the previous week.Jarret Johnson burst through the left side to force a fumble on second down that the Bears recovered, and Cutler held the ball too long on the next play, resulting in a sack for Corey Liuget.Forte set up the Bears first touchdown on the next possession when he turned a pitch into a 58-yard sprint down the left side to the 5. Marshall, who sat out last week after having offseason hip surgery, then caught a strike from Cutler in tight coverage to give the Bears a 7-0 lead.They had a chance to add to it after Chris Conte picked off Rivers at the 35 on the next possession. But on the first play, Cutler got intercepted by Donald Butler trying to hit Marshall in double coverage.”I didn’t misread,” Cutler said. “I knew what I was doing. (I) kind of got clipped, I let it go, but those are the ones that you kind of want to check down after you see the picture.”Trestman tried to take some blame for the pick, saying the Bears had not run that play much.He also made it clear he wasn’t thrilled with Cutler’s decision, saying, “There’s a time to force the ball and use your arm and put it up into man-to-man coverage when there’s a single man and a single player, and that really wasn’t one of those situations.”That Peppers sat out his second game was a bit of a surprise, considering Trestman had said he would play.The Chargers held out Danny Woodhead because of his undisclosed injury and receiver Malcolm Floyd after he hurt his right knee in practice on Monday. Rookie linebacker Manti Te’o also sat out as expected after spraining his right foot against Seattle last week.Liuget left late in the first quarter with a shoulder injury. And Bears third-string quarterback Matt Blanchard broke a knuckle on his left hand in the second half, forcing Josh McCown back into the game. Trestman wasn’t sure how long he would be out but did say the Bears will need to bring in another QB. WAUKEGAN—Jereme Richmond, who was a four-star, top-30 player coming out of high school and played one season at Illinois (2010-11) faces up to seven years in federal prison. According to the Associated Press, Richmond has been convicted of threatening a probation officer. A Waukegan, Ill., jury found Richmond guilty Thursday; he’ll be sentenced on Sept. 26. Per Richmond’s attorney, there remains a possibility he will avoid jail time and receive even more probation. Richmond, who in 2011 declared for the NBA Draft — and went undrafted — is 21 years old. Richmond was arrested in April after telling a probation officer to “be real safe,” according to police reports. He also allegedly mimed the act of holding a gun to the female officer. The arrest came 14 months into an 18-month probation period. Lawrence Wade, Richmond’s attorney, said his client had made no threats. The probation stemmed from a guilty plea in 2012 after Richmond copped to “unlawful use of a weapon,” according to the AP. That case saw allegations against Richmond of physical abuse toward a 17-year-old girl that also included allegations of violence against the girl’s family. Richmond was a McDonald’s All-American and named Mr. Basketball in Illinois in his senior year of high school. While at Illinois, he averaged 7.6 points and 5.0 rebounds. CHARLOTTE—New head coach, same opportunistic Bears defense. They forced three first-half turnovers and linebacker Jonathan Bostic returned an interception 51 yards for a touchdown, but the Carolina Panthers spoiled Marc Trestman’s NFL head coaching debut with a 24-17 win over Friday. The Bears — who had four turnovers — picked up where they left off last season when they led the NFL with 44 takeaways and finished with nine defensive touchdowns, one shy of the league record.Problem was the Bears offense couldn’t do a thing for the better part of three quarters. Carolina’s second-year cornerback Josh Norman had two interceptions, including a 60-yard return for a touchdown against Matt Blanchard. The Bears had three turnovers and allowed seven sacks. Jay Cutler was intercepted on the Bears first play from scrimmage by Norman, setting up a 3-yard touchdown pass from Cam Newton to Brandon LaFell. Cutler bounced back to complete 6 of 8 passes for 56 yards, but the Bears offense managed only a field goal in the first three quarters.Tight end Fendi Onobun dropped a wide open pass in the end zone from Josh McCown in the second quarter and the Bears turned the ball over on the next play at the Carolina 12.Matt Forte carried once and lost a yard and the Bears were held to 16 yards rushing on six carries and 85 total yards in the first half. Newton’s night was a mixed bag.Carolina’s third-year pro played three series and was 3 of 6 for 16 yards with the one touchdown to LaFell on a crossing route. But what had been a mostly positive night turned sour when Newton threw into double coverage and was intercepted near midfield by Bostic, who ran untouched to the end zone.Newton didn’t return to the game after that. “Cam got a little greedy and tried to force the ball in there,” Panthers coach Ron Rivera said. The Panthers tried to emphasize their push toward a “more traditional running game,” but struggled to move the ball with DeAngelo Williams held to 10 yards on five carries.With running backs Jonathan Stewart and Mike Tolbert out with injuries, the Panthers got a long look at their three young running backs — Tauren Poole, Armond Smith and sixth-round pick Kenjon Barner from Oregon.Barner scored on a 5-yard touchdown run late in the first half to give Carolina a 14-10 lead at the break. The Panthers have been waiting three years for Armanti Edwards to emerge and the former third-round pick is starting to show some flash as a potential No. 3 receiver.Edwards, who has been praised by Rivera for his play in training camp, caught two passes for 38 yards.Carolina’s much-questioned secondary performed well. Norman, entering his second season, started in the team’s nickel defense and his interception of Cutler set up Carolina’s first touchdown. “I’m calmer this time around as opposed to my rookie year,” Norman said. Cutler, who said the Bears didn’t do much in terms of game planning, called it an unfortunate start. Typical regular season game for the Bears defense though.The Bears lost Brian Urlacher to retirement and are starting two new linebackers in D.J. Williams and former Panther James Anderson. But it seemed as if they didn’t miss a beat early on, forcing three first-half turnovers. NOTES—Prior to the game, the Panthers held a moment of silence for Jon Richardson, the son of Panthers owner Jerry Richardson, who died last month after a long battle with cancer. Jon Richardson had worked in previous years as the franchise’s director of stadium operations.